Last year was not easy for Mercedes, but the team will have learned a lot more from that than it would have done on a walk in the park. Mercedes had the car for the faster tracks but Ferrari was on top at the slower ones. In the end, more tracks suited Mercedes with 15 pole positions and 12 wins than Ferrari, with five poles and five wins. The 2018 W09's front wing has short wing mounting pillars and a narrow nose assembly, including the cape underneath the nose, and doesn't look very different from what Mercedes ended '17 with. But as I have said before, as the wing is a bolt-on component, if you believe there is not much more to come from it there is no need hurry developments in this area. Starting with a well understood front downforce producing package allows the design team to concentrate on what is coming along behind. This is certainly what it will have done. The front suspension is the first area Mercedes has focused on. It retains the high outboard top wishbone mounting position. This allows Mercedes to run a more horizontal wishbone configuration than if it was mounted inside the rim. This in effect lets Mercedes be a little more sympathetic to the tyres' requirements as far as suspension geometry is concerned. Mercedes has also put the steering trackrod in line with the bottom wishbone. To achieve this, the top and bottom outboard wishbone pivot points are well behind the centre of the wheel. This means that if the car was sitting still and steering lock was applied there will be some lateral movement of the chassis away from the centre of the corner. On the circuit at speed, it could mean that the front tyre picks up the lateral load just that little bit slower, allowing the rear tyre to induce its slip angle before the front loads up. How the tyre loads up and how it optimises the tyre contact patch at different steering angles and hence speed is a combination of the castor and kingpin angle. It's an interesting development, but will it work? 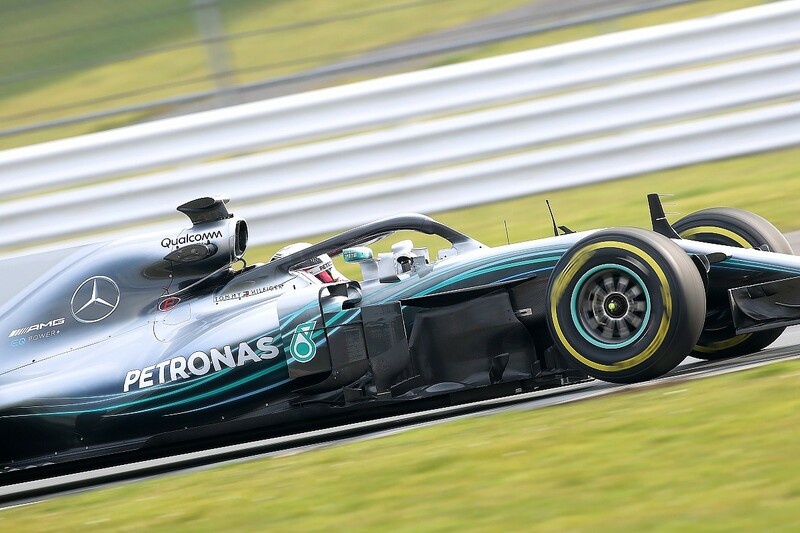 By having the two front wishbones more horizontal and with the trackrod integrated at bottom wishbone height and giving the combined unit a longer chord length, Mercedes is able to manage the wake coming off the front wing just that little bit better. This is done by reducing its upward flow, which in turns will improve the bargeboard and leading edge of underfloor performance. Mercedes has a carbon wrap around the halo, but doesn't seem to have done much to improve the airflow across it. I wonder who will be the first to produce a fairing with golf ball style dimples? The bargeboard area is a combination of many components, all of which are there to scavenge the airflow out from underneath the front of the chassis. As the airflow comes off the trailing edge of all the small vertical vanes, various vortices flow down the undercut sidepod area and help to reduce the airflow leakage at the outer extremity of the floor. The low pressure under the car means the airflow outside wants to come underneath the car, so reducing that leakage is the order of the day and increases downforce. The floor section of the bargeboards look like they are multiple boomerangs with swept up trailing edges. Again, this area is there to prepare the airflow for the leading edge of the underfloor. The diffuser itself can only do some much to accelerate the airflow that is passing underneath the car, so initial preparation of the flow that goes under the car is again important to how much downforce the underfloor can generate. The outer vertical vanes are similar to last year - three elements, with the rearmost one blending into a horizontal vane running across the top of the sidepod leading edge. The vertical section of these components is there to control the turbulent wake coming off the rear of the front tyres. If they weren't there, this turbulent wake would be pulled into the leading edge of the underfloor, reducing the underfloor's performance. The upper horizontal section is to reduce the lift that is created by the airflow being accelerated over the top of the sidepod leading edge. The delta-shaped wing section coming out from the side of the chassis and sweeping rearward is there to realign the wake coming off the front wing trailing edge. It is this complicated swept-back shape because it requires a shadow plate at what is called the step plane of the underfloor. So, the leading edge of it is in line with the leading edge of the first part of the boomerang bargeboard floors that I spoke about above. I'm not seeing any components in this area that suggest Mercedes has done anything trick with the location of the side impact structures. 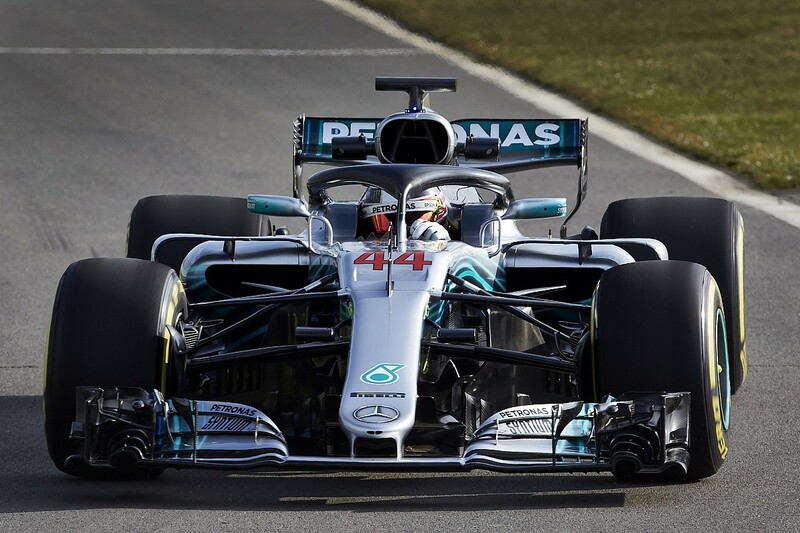 To get a reasonable gap between the trailing edge of the front tyres and the leading edge of the sidepod, Mercedes has retained the longish wheelbase. Mercedes was very good on the fast tracks last year and there are more of them than slow ones. As for the sidepods themselves, they have a fairly high letterbox slot-style inlet. This is wider than some of the previous cars we have seen so far this year, with an undercut below that inlet. The undercut continues right through the sidepod to the Coke bottle area, so the main design philosophy here is to allow the Coke bottle area to pull airflow through that undercut from the trailing edge of the bargeboards, which in turn pulls airflow through from underneath the front of the chassis and trailing edge of the front wing. As with the other cars, the integration of the halo is what it is. The structural part of the halo is basically a titanium tube. Mercedes has a carbon wrap around this, but doesn't seem to have done much to improve the airflow across it. But then it could be in the detail. I wonder who will be the first to produce a fairing with golf ball style dimples? Behind all of that, other than the engine cover fin size being reduced to comply with the new regulations, the car looks very similar to last year. 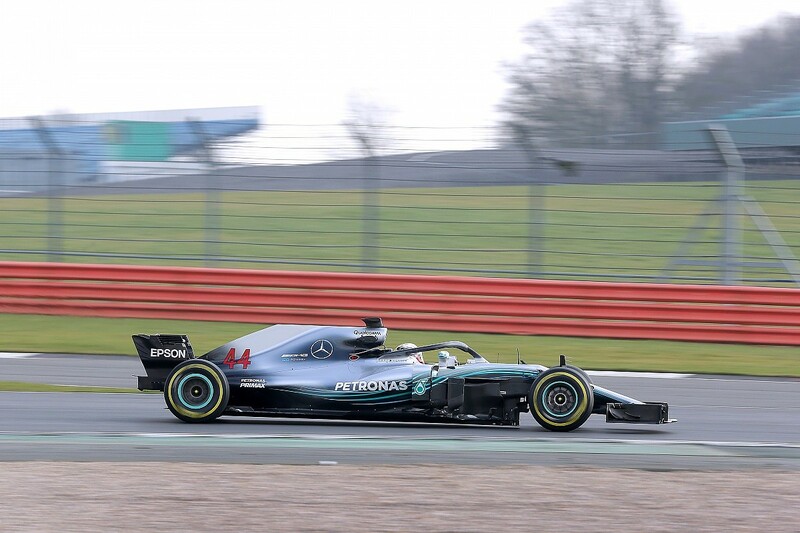 It doesn't look from the pictures of the shakedown test at Silverstone that Mercedes is running the car with high rake angles (high rear ride height), although the team says they will be higher than last year. I'm pretty sure the diffuser will have had some treatment to allow them to accommodate this if necessary when testing begins but we will have to wait until the Barcelona test to get close up and friendly with the finer detail. It's tough for a team that has had the success of Mercedes. When you are at the top of the ladder there are very few steps left to take, so the return from research and development gets minimal. As they say, the devil's in the detail and as Mercedes admits it was a little confused with the 2017 car. 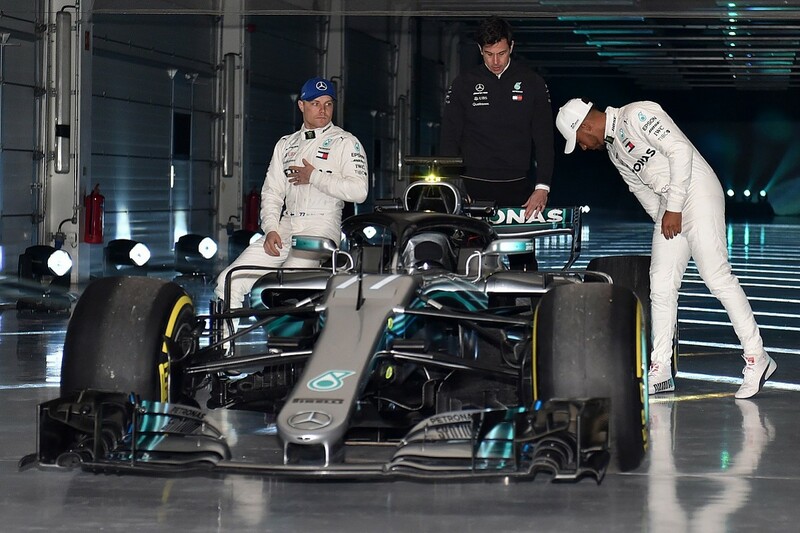 So, from what I see, I think Mercedes has optimised what it had last year and will head into '18 will a better understanding of how to run the car. But the changes to the front suspension will be interesting.